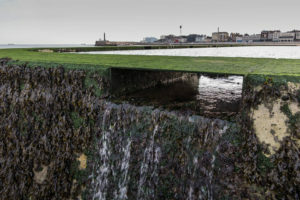 The tidal pool on Margate sands was built in 1900. Such pools emerged in the latter part of the 19th Century as sea swimming became a regular part of a visit to the seaside, and was liberated when the legal segregation of bathing areas in Britain ended in 1901. Sea bathing was fashionable, but squelching through wet sand and seaweed at low tide was not; and the pools were a convenient way to exercise in the briny without additional hazards of currents and tides (just watch out for crabs). 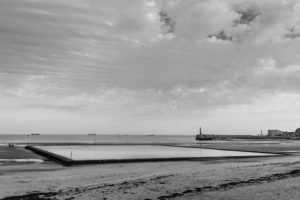 Margate has a second tidal pool at Walpole Bay, built in 1937 to designs by Margate’s borough engineer, Mr. E. A. Borg. It is constructed of concrete blocks reinforced by reused iron tram rails and is listed Grade II. There are 24 tidal pools in the British Isles and Margate is the only place with two. Rob Ball celebrated the pool’s 80th anniversary in 2017 by making tintype portraits of the swimmers, http://www.robball.co.uk/itinerant/. Archaic tintypes seem an appropriate way to capture the nostalgia of tidal pools.